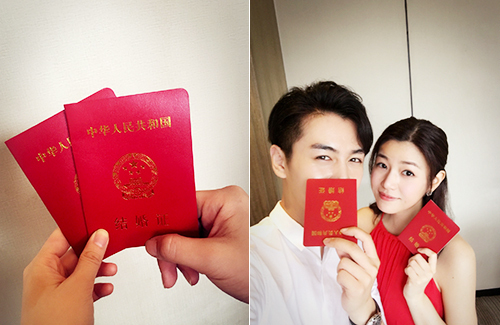 Michelle Chen (陳妍希) and Chen Xiao (陳曉) are married! On Tuesday, July 5—also Chen Xiao’s 29th birthday—the Double Chen couple announced on social media that they have officially registered for marriage in Anhui, Chen Xiao’s hometown. The couple will be holding their wedding ceremonies in Beijing, Taipei, and Anhui in the next two weeks. Chen Xiao broke the news on Weibo first, saying, “16.7.5. From this day forward, you have become my wife. I anticipate the arrival of our new life!” He also attached two photos of him and Michelle holding their marriage license. From Michelle’s message, it looks like the couple are also expecting a baby. Triple the happiness! Michelle and Chen Xiao met in 2013 on the set ofThe Romance of the Condor Heroes <神雕俠侶>, respectively portraying Little Dragon Girl and Yang Guo. Their relationship went public in late 2015 after the paparazzi snapped photos of them on vacation overseas. In October of that year, Chen Xiao proposed to Michelle in Paris. According to sources, Chen Xiao proposed with a 2 million RMB ring and a statue of Michelle’s Little Dragon Girl. Michelle and Chen Xiao’s “Triple Happiness” isn’t the only good news that came on July 5. Fellow actors, Ruby Lin (林心如) and Wallace Huo (霍建華), announced on the same day that they will be getting married in Bali! All the best to them!! Happy for them.lots of ppl getting in the recent months. Is it the weather or are airfares cheaper this time of the year? At first I thought those were lucky envelopes. Congrats to the lovely couple. They’re so cute together. 2016 is the year of older women-younger men relationships.